This week we've been all about scarecrows around our house. Due to being married to a former farmer and my son's bedroom being stocked in all things farm, we have a lot of scarecrow examples throughout books, pictures, toys, etc. I heard some teachers at school talking about scarecrow books and activities the other day, so I decided to jump on the theme. 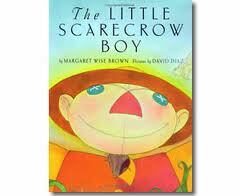 One of the books that I was introduced to was The Little Scarecrow Boy by renowned children's author Margaret Wise Brown. It's a great tale just like her Goodnight Moon and The Runaway Bunny, but David Diaz's artwork, might move it up a notch on my favorites list. What a touching story it is of a little scarecrow boy who just wants to be like his daddy. 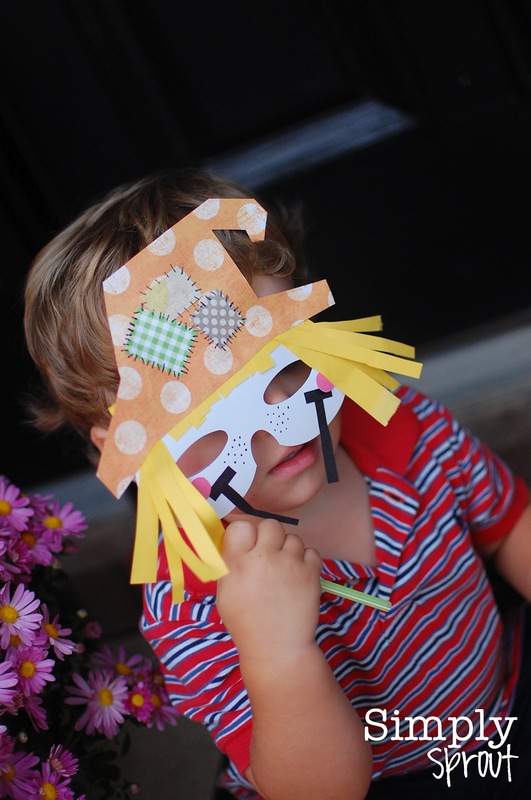 His daddy is a fierce scarecrow, and his son just doesn't have the knack for keeping the crows away just yet. His dad reminds him that he can be a fierce scarecrow when he is older. Reading the story brought a smile to my face because my son hears this a lot from his daddy. He asks to mow the lawn, hammer, saw, grill, and so much more. My husband gently reminds him that he can do all these things when he is a little bit older. He patiently waits and watches his daddy in action. The little scarecrow boy did just that too, until one day he goes out into the field alone. With a sweet ending and beautiful illustrations, you will be swept into the fall season after reading. We used this mask to act out the story after we read it a couple of times. I had the cardboard mask forms (found at a craft store) from another project. I used paper from our scrap basket (I think I've said before that I find a scrap basket in my home and classroom to be invaluable for projects). We glued pieces here and there, and our scarecrow slowly came to life. Of course when we were almost done I found a pattern on a great scrapbooking website. Of course any reason to break out the candy corn is a great activity in my eyes! 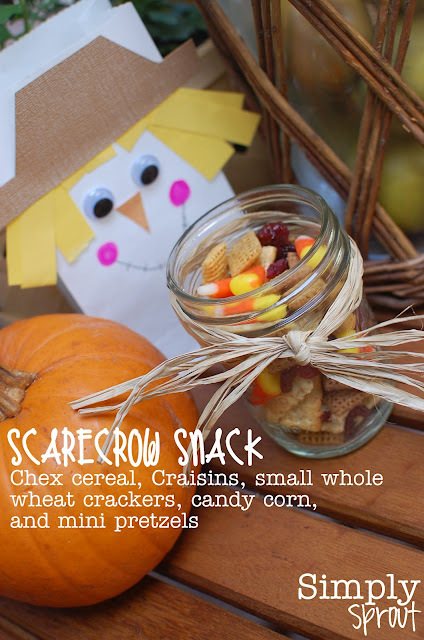 We headed to the kitchen and concocted a Scarecrow Snack. A yummy afternoon snack! The scarecrow bags are getting decorated for my son's preschool class to enjoy this snack too. Have fun celebrating this season with your children! 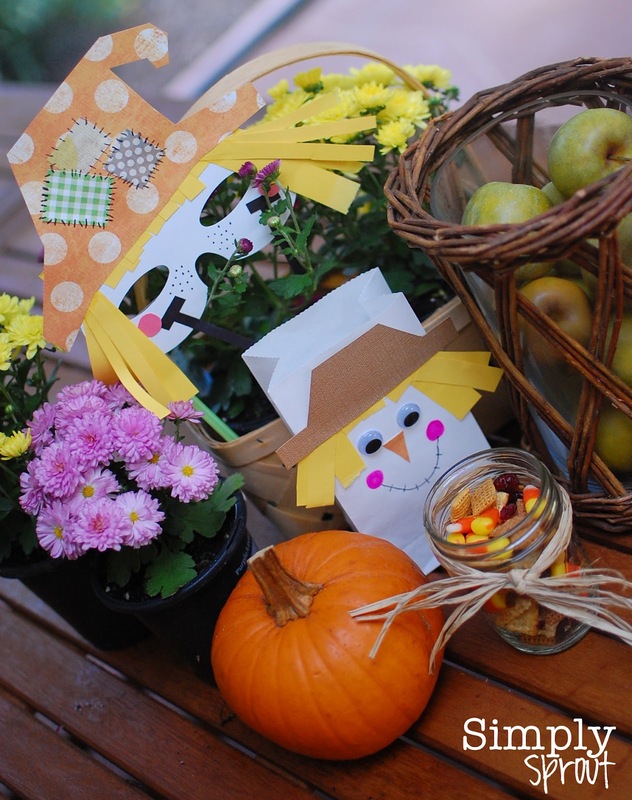 Add scarecrow crafts to your fall bulletin boards by using Simply Sprout's Fall Bulletin Board Kit.